Part of drill class with Fred is a weekly 15-20 minute sense memory exercise. Recently he asked me to come up with two pieces of music to “listen” to and for the life of me I couldn’t seem to find the freedom to just relax and let it happen. Week after week I would try, and each time Fred would point out that I seemed self conscience. Drill class wisdom. Yes, it certainly is. But I’ll probably still run the next one naked if it’s an option. In Cay’s defense relaxation does seem to be the key half the time between a good rehearsal and a difficult one. On this day Cay was talking to Annie about a bumpy first run of her “Other Desert Cities” scene with Johnny two weeks ago. After a few pages Cay had stopped the scene and asked them to get in touch with themselves, start taking in their partner a little more, and most importantly, relax a bit. “What’s different in your rehearsal today compared to what you were doing on your own?” Cay asked. A sense of privacy is one of the most difficult things we are asked to achieve as actors on stage. Vulnerability, permeability, is the magic of a truthful performance, the key to behaving realistically under imaginary circumstances, but it also comes with the burden of opening ones self up to deep connection in front of an audience of people. It isn’t easy. What we do is hand crafted, and this is where it happens. One of the exercises she gave Annie was to use her partner to find that sense of privacy. It’s a technique I used myself while working on a production of Woyzeck last October. We had a 4 month rehearsal period, unusually long in modern theatre. The advantage was a sense of trust and comfort with the material like I’ve never had before. But after awhile rehearsals started to feel stale, spontaneity fell into repetition. To keep the performance fresh I would work each night to find something new in the actor who I had been standing across from for months, something to fall a little bit in love with. Sometimes it was a freckle or blemish I had never noticed, sometimes the way his cloths hung from his body. Once it was the shape of his jaw line, the way it tracked from behind his ear and down to his neck. It feels like when you’re sitting across from an actor you’ve worked with a hundred you couldn’t possibly find something new in them. But you can. And that pleasant surprise when you do manage to find it gets the engine going in a wonderfully immediate way, and brings with it the sense of public privacy. Relaxation came up again in the Monday night class I visited two weeks ago. 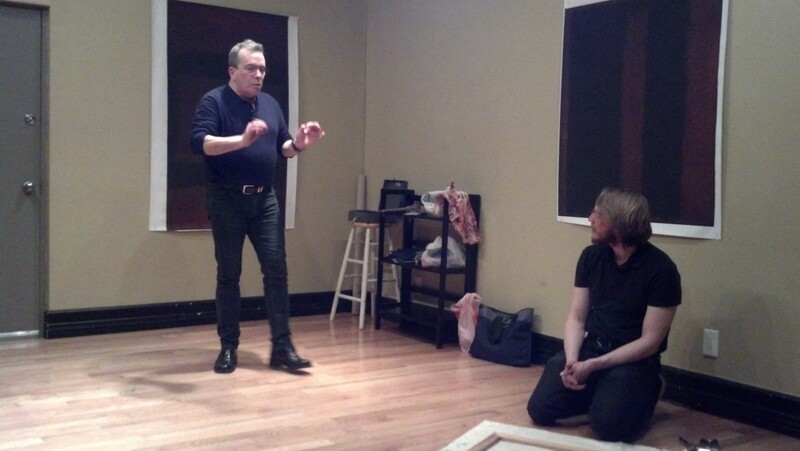 Frank and Owen were rehearsing a scene from “Red”, a play about the artist Mark Rothko. For their rehearsal they had printed out massive copies of Rothko’s paintings and hung them around the stage, turning it into a full fledged replica of the artist’s studio. Frank was having trouble early on getting his mouth around the opening monologue. After a few lines he stopped entirely. When the scene finished Frank admitted he was feeling out to touch. “I felt tense. I felt like this.” He held his hand up and pressed the back of it into his jaw, forcing his mouth to clench shut. Frank said that it would be a shame to let the scene go like this. Owen agreed and asked to do it one more time with relaxation in mind. The second time through they reached a moment after Frank’s opening monologue in which he tells Owen he thinks the artists of his generation are trying to kill him with their work. Owen: You think Jasper Johns is trying to murder you? Owen: What about Frank Stella? Frank: Which one is he? When they reached the moment where Owen fights back against Frank’s characters distain for popular art Cay stopped him. Owen nodded and took a deep breath. His weight shifted from the balls of his toes to a much more relaxed open stance, and they finished a rehearsal that was less inhibited, more spontaneous and much more fun.